We've mentioned several times in our introductions to our releases how much we enjoy meeting new artists and discovering new music. Our joy continues unabated as we welcome prolific Russian electronic musician and all-around renaissance man Evgenij V. Kharitonov to the Earth Mantra family. Evgenij releases intelligent and thought provoking electronic music under the name EugeneKha. When we first sat down to listen to his new eclectic ambient release Distant Space, we were initially somewhat concerned by the length of the album. "How can anyone say anything of substance in only 40 minutes of audio? ", we wondered to ourselves. How refreshing it was to discover that not only does this music have plenty to say, but has a density and efficiency that is simply remarkable. EugeneKha carefully chooses his every note and sound, making maximum use of every moment of listening. The duration of the album is perfect for the music; in fact, the music might have been ruined if it were embedded in another twenty or thirty minutes of ambient washes or field recordings. Perhaps ambient music does sometimes spend too much time establishing the setting but not enough time actually delivering the message. This fantastic artist shows us a path forward where the music communicates exactly the right way in precisely the right amount of time, without sacrificing the creativity or scope of vision in the slightest. And the music delivers in spades. Evgenij describes his album as "space ambient" but it is much more than the typical space music fare one might expect. He blends in delicious bits of electronica, with an arpeggio here, some glitchiness there, and always with an inventive and fascinating approach to sound design. Not only does this music sound like nothing else we've heard, it doesn't even follow the same formula from track to track. 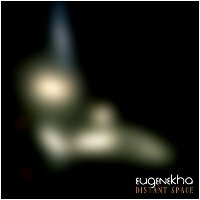 The breadth of EugeneKha's musical vision and the flexibility of his approach is actually quite astonishing. So we are very pleased to bring you Distant Space, EugeneKha's first Earth Mantra release, one that we hope leads to many other releases in the future. And congratulations to EugeneKha for reminding us that music isn't about duration or predefined formulas; it is about meaning and creativity. This album has a very strong cinematic and atmospheric sound, making the music very visual. Throughout the album the music varies quite abit and is interesting to listen to: sometimes there are beats with "futuristic sounds" (for lack of a better word), sometimes the music is more drone-like and a bit darker in mood. You get the feeling that whoever made this music really enjoyed making it, the album is creative and fun to listen to. This Space Music is simply awsome! Like to hear more in the future!! This recording is much more than just tonal space music to drift away in. It is plesantly interesting to listen to. I will enjoy getting better aquainted with these songs.